This article is about the Roman soldier. For other uses, see Longinus. Inside the St. Peter's Basilica, in the Vatican. Longinus /ˌlɒnˈdʒaɪnəs/ is a legendary name of Christian history given in medieval and some modern Christian traditions to the Roman soldier who pierced Jesus in his side with a lance, the "Holy Lance" (lancea, as related in the Latin Vulgate Bible) during the Crucifixion. This act created the last of the Five Holy Wounds of Christ. This individual, unnamed in the Gospels, is further identified in legend as the centurion present at the Crucifixion, who testified "This man certainly was the Son of God." Longinus' legend grew over the years to the point that he was said to have converted to Christianity after the Crucifixion, and he is traditionally venerated as a saint in the Roman Catholic Church, Eastern Orthodox Church, and several other Christian communions. Saint Longinus in Saint Peter's Basilica by Bernini. No name for this soldier is given in the Gospels; the name Longinus is instead found in the pseudepigraphal Gospel of Nicodemus that was appended to the apocryphal Acts of Pilate. Longinus did not start out as a saint. An early tradition, found in the 4th-century pseudepigraphal "Letter of Herod to Pilate", claims that Longinus suffered for having pierced Jesus, and that he was condemned to a cave where every night a lion came and mauled him until dawn, after which his body healed back to normal, in a pattern that would repeat till the end of time. Later traditions turned him into a Christian convert, but as Sabine Baring-Gould observed: "The name of Longinus was not known to the Greeks previous to the patriarch Germanus, in 715. It was introduced amongst the Westerns from the Apocryphal Gospel of Nicodemus. There is no reliable authority for the Acts and martyrdom of this saint." However, an old tradition does link the birthplace of Longinus with the small village of Lanciano, Samnite territory, in today's Abruzzo region of Central Italy. The name is probably Latinized from the Greek lonche (λόγχη), the word used for the lance mentioned in John 19:34. It first appears lettered on an illumination of the Crucifixion beside the figure of the soldier holding a spear, written, perhaps contemporaneously, in horizontal Greek letters, LOGINOS (ΛΟΓΙΝΟC), in the Syriac gospel manuscript illuminated by a certain Rabulas in the year 586, in the Laurentian Library, Florence. The spear used is known as the Holy Lance, and more recently, especially in occult circles, as the "Spear of Destiny", which was revered at Jerusalem by the sixth century, although neither the centurion nor the name "Longinus" were invoked in any surviving report. As the "Lance of Longinus", the spear figures in the legends of the Holy Grail. Christian legend has it that Longinus was a blind Roman centurion who thrust the spear into Christ’s side at the crucifixion. Some of Jesus’s blood fell upon his eyes and he was healed. Upon this miracle Longinus believed in Jesus. 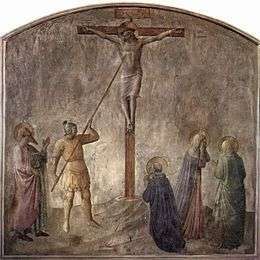 The body of Longinus is said to have been lost twice, and that its second recovery was at Mantua in 1304, together with the Holy Sponge stained with Christ's blood, wherewith it was told—extending Longinus' role—that Longinus had assisted in cleansing Christ's body when it was taken down from the cross. The relic, corpules of alleged blood taken from the Holy Lance, enjoyed a revived cult in late 13th century Bologna under the combined impetus of the Grail romances, the local tradition of eucharistic miracles, the chapel consecrated to Longinus, the Holy Blood in the Benedictine monastery church of Sant'Andrea, and the patronage of the Bonacolsi. The relics are said to have been divided and then distributed to Prague and elsewhere, with the body taken to the Basilica of Sant’Agostino in Rome. However, official guides of the Basilica do not mention the presence of any tomb associated with Saint Longinus. It is also said that the body of Longinus was found in Sardinia; Greek sources assert that he suffered martyrdom in Gabala, Cappadocia. Longinus the Centurion. Russian icon by Fyodor Zubov, 1680. 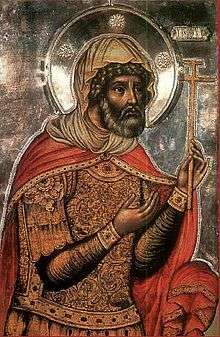 Longinus is venerated, generally as a martyr, in the Roman Catholic Church, the Eastern Orthodox Church, and the Armenian Apostolic Church. His feast day is kept on 15 March in the Roman Martyrology, which mentions him, without any indication of martyrdom, in the following terms: "At Jerusalem, commemoration of Saint Longinus, who is venerated as the soldier opening the side of the crucified Lord with a lance". In the Armenian Apostolic Church, his feast is commemorated on October 22. Longinus and his legend are the subject of the Moriones Festival held during Holy Week on the island of Marinduque, the Philippines. In Irving Pichel's 1939 film The Great Commandment Albert Dekker portrays him as the commanding officer of a Roman army company escorting a tax collector about Judea. Subsequently, he is converted to Christianity through the kindness of Joel bar Lamech and by his own experiences at Golgotha. In the George Stevens's 1965 film The Greatest Story Ever Told, Longinus is identified with the centurion who professed, "Truly this man was the Son of God" on Golgotha (portrayed by John Wayne in a cameo role). The character Casca Rufio Longinus of the "Casca" adventure novel series originated by Barry Sadler is loosely based on the Longinus legend. In Roar, a TV series starring Heath Ledger, one of the major villains was Longinus (Sebastian Roché), an immortal cursed by God for interfering with his plans. The Spear of Destiny was supposedly the only weapon that could release Longinus from his curse. In the historical novel The Empty Throne by Bernard Cornwell, a version of the legend is given. In this version, when Longinus pierced the side of Jesus, the blood fell on the soldier's eyes and cured him of his blindness. But because he had violated the Lord's body, he was cursed with a horrible curse: to become an immortal soldier, forever killing and being killed, and coming back to life after every death. In the historical novel "The Spear" author Louis de Wohl describes the life of Cassius Longinus who becomes a saint of the Church. Sixteen of his books were made into films in Germany. The "Lance of Longinus" plays a part in the popular 1995 anime Neon Genesis Evangelion, among many other Biblical references. Frescoe of in Basilica of St Peter and St Paul in Vyšehrad (Prague). ↑ Ehrman, Bart, "Forged: Writing in the Name of God", Chapter 5. ↑ Baring-Gould, The Lives of the Saints, vol. III (Edinburgh) 1914, sub "March 15: S[aint] Longinus M[artyr]"; Baring-Gould adds, "The Greek Acts pretend to be by S. Hesychius (March 28th), but are an impudent forgery of late date." (on-line text). ↑ Torretto, Richard. A Divine Mercy Resource: How to Understand the Devotion to Divine Mercy. iUniverse, 2010. p. 148. Web. 19 Apr. 2011. ↑ Sniadach, Keith. Relics of God: A Supernatural Guide to Religious Artifacts, Sacred Locations & Holy Souls. Keith Sniadach, 2010. p. 73. Web. 19 Apr. 2011. ↑ See at Kontos; "The name cannot be ascribed to any tradition; its obvious derivation from longchē (λόγχη), spear or lance, shows that it was, like that of Saint Veronica, fashioned to suit the event," noted Elizabeth Jameson, The History of Our Lord as Exemplified in Works of Art 1872:160. ↑ Godwin, Malcolm (1994). The Holy Grail: Its Origins, Secrets & Meaning Revealed. Viking Penguin. p. 51. ISBN 0-670-85128-0. ↑ Clarke, Howard W. (2003). The Gospel of Matthew and Its Readers: A Historical Introduction to the First Gospel. Indiana University Press. p. 241. ISBN 0-253-34235-X. ↑ Leonard Maltin, 2004 Movie & Video Guide, (New York: New American Library, 2003), 558 sub loco. ↑ Bernard Cornwell, The Empty Throne, 2015, ISBN 9780062250711 - pages 104 to 105.